Home is place where we spend most of our time after the part when we are at work. Home is our intimate corner to enjoy and relax so it is necessary to pay special attention of its interior. Edit your home with love, because only in that case it will be your personal paradise. 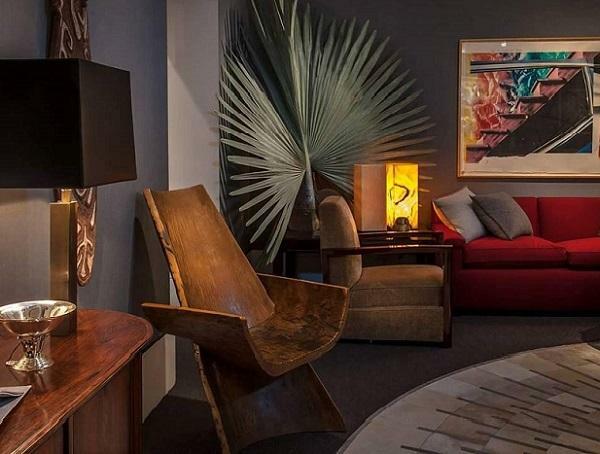 Many styles of interior design exist, but you choose the best for your senses. 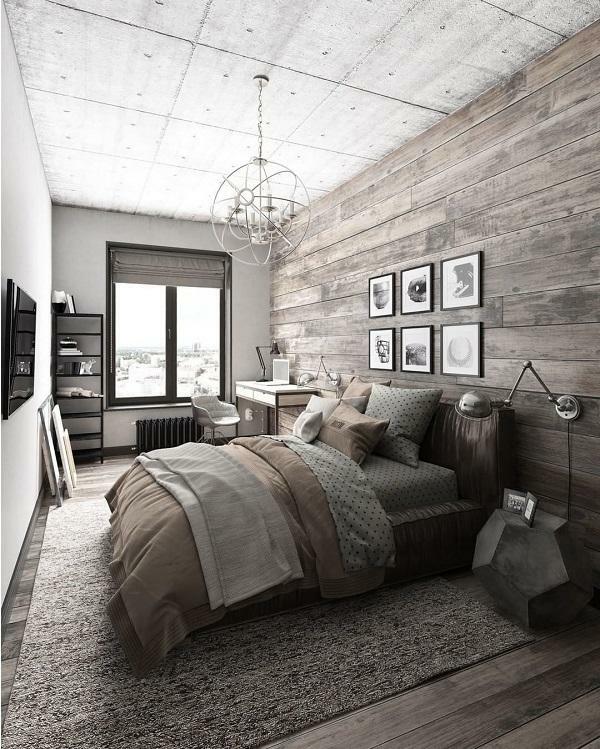 Rustic style is appropriate for country houses but also it is great idea for modern flats in the city. 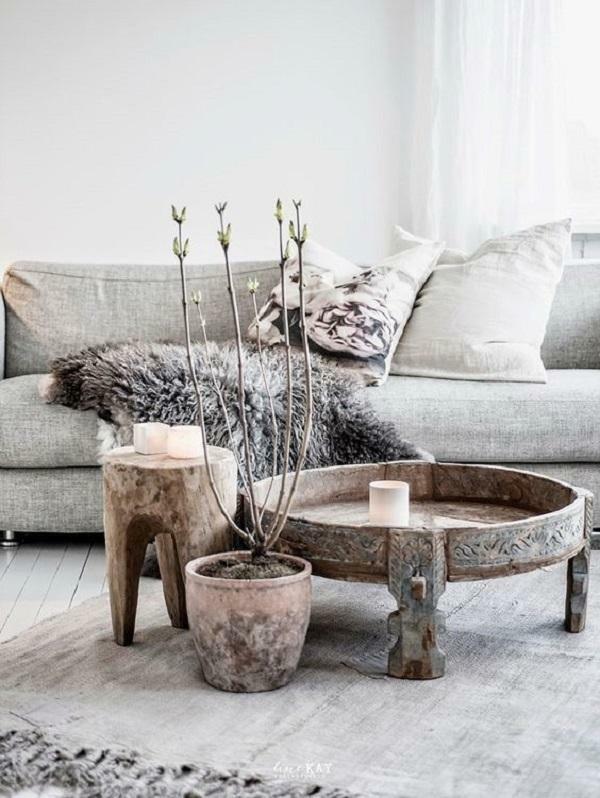 In rustic style dominate natural materials like stone and wood, cotton, leather, wool … In the rustic decorated home we’ll find lace, rustic locks, wreaths, curve, monochrome blankets, pillows, or the opposite, pillows and bedspread with floral accents – mostly roses. Rustic decorated homes evoke the warmth of the past, of your childhood. Brown, beige, white, lilac color, darker green and strong yellow color. The living room has a fireplace framed with rough wood, stone … In these homes, there are plenty of pottery and wrought iron. The floors are made of stone, marble or wood too, and over them are carpets with interesting patterns in earth tones. Oak is a common option when people choose material for floors, and oak is followed by ash, cherry, pine, walnut … Floors made of stone, rustic tiles and marble are easy to maintain, so I advise them for the bathrooms, to lobbies, terraces and porches. 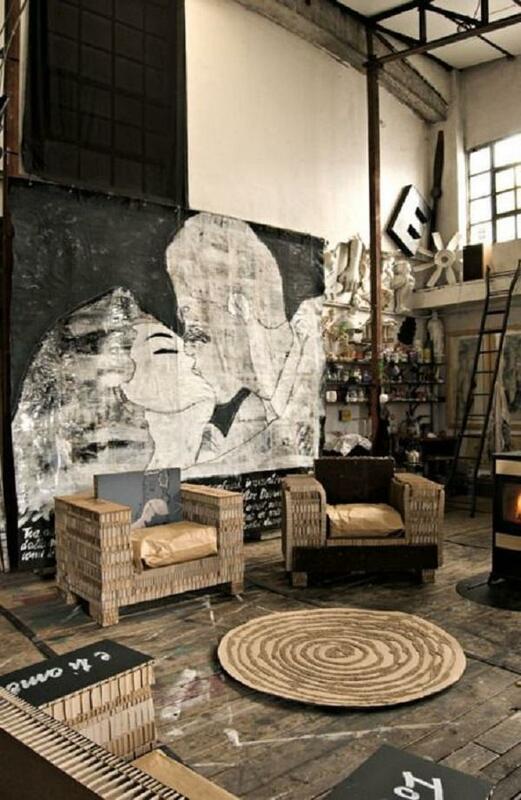 Rustic floor can be combined with modern furniture, and that can be very interesting. Rustic under will alleviate the sharp edges of modern furniture. The ceiling is often made of wood, and is surrounded by large beams. 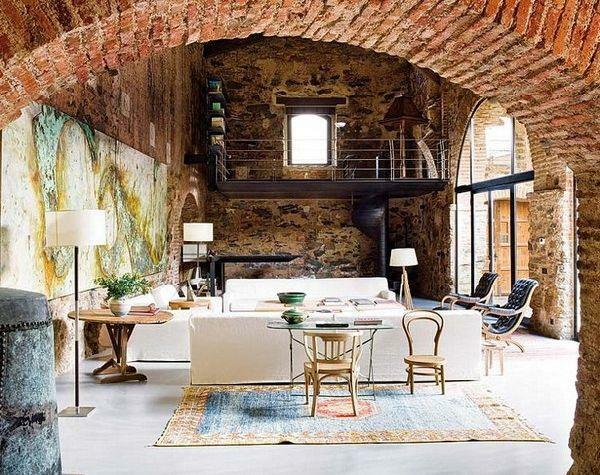 One wall is coated with brick that reminds on old and used brick. 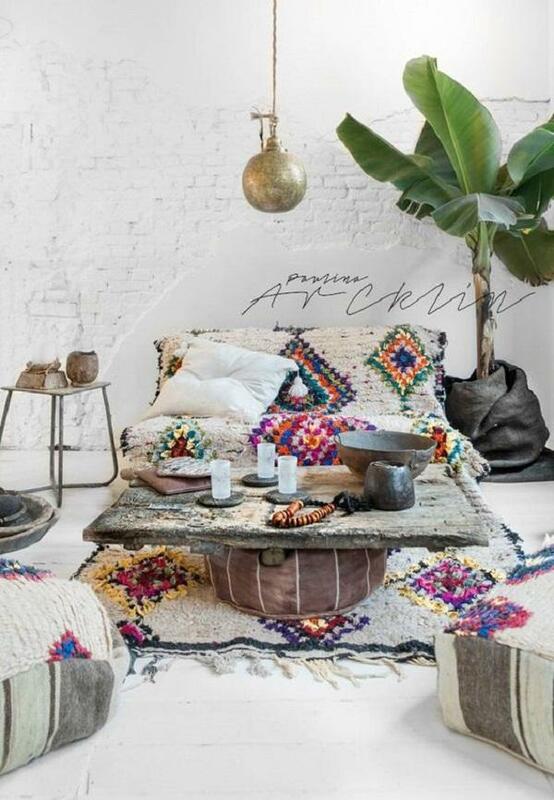 My advice to you is to carefully choose the details for your home, but the most important thing is that you create your home with heart and love, because it’s the most beautiful detail in home and in life. 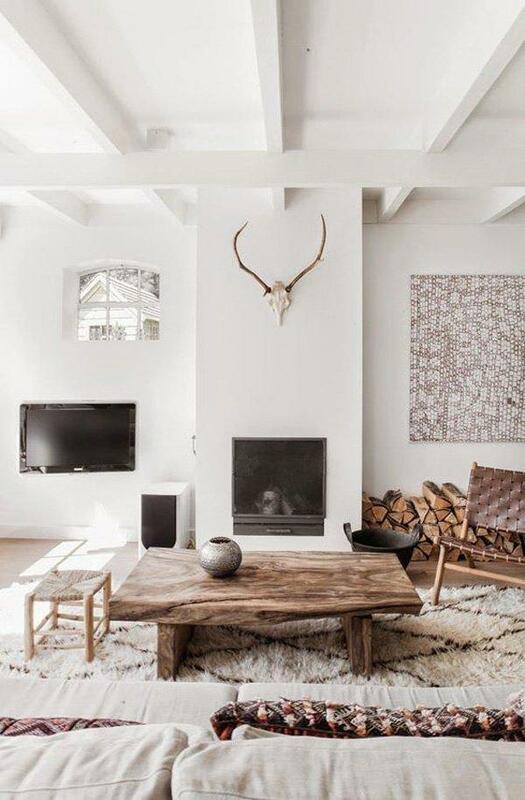 Modern style that characterizes minimalism can be nicely combined with a rustic design. More and more young people are deciding for this type of home furnishing. 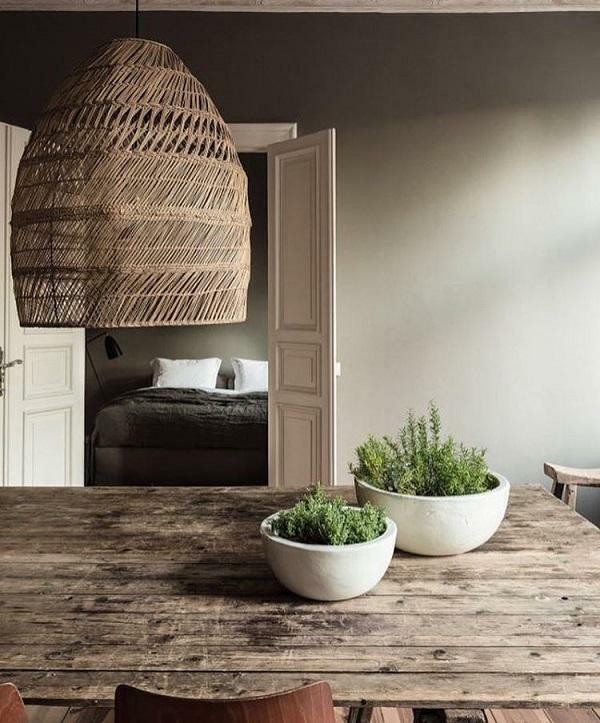 Check out this interesting old birdcage made of wood that was used as a chandelier in a modern apartment. What looks more rustic than the brick wall? 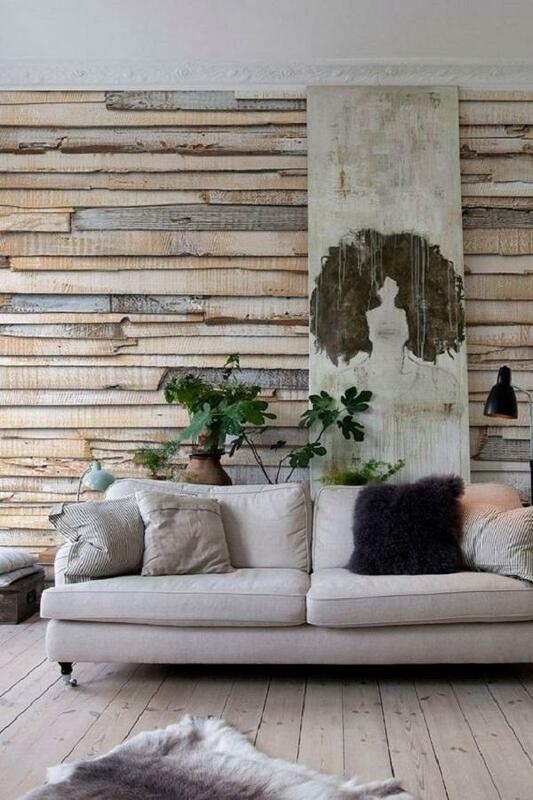 Pallets are increasingly used in modern home decoration and on the internet you can find many ideas for how use pallets. In this photo is one of those ideas! Earthy tones give an extra dose of warmth to this home except the burning fireplace. Stone and wood are in great proportion, there is nothing superfluous, the house is a true paradise that warms the soul and body. The modern bathroom that is perfectly decorated with rustic details such as the commode for the sink and the bath mat made of woven wood. 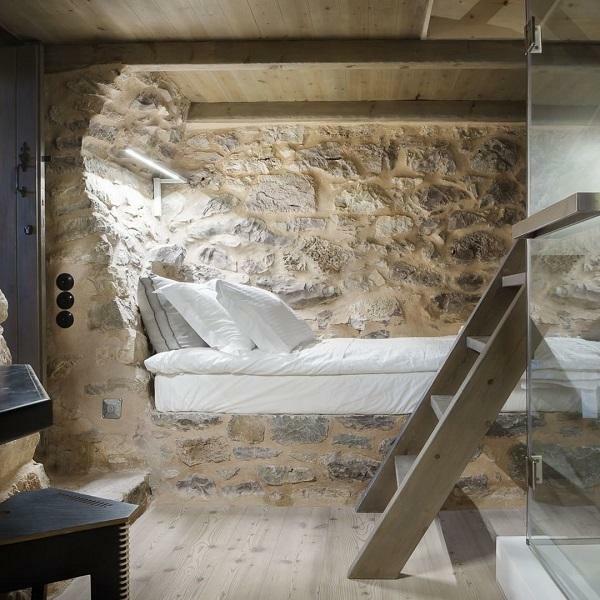 Modern decorated apartment, with beautiful furniture from wood and all wall of stone bars. The room is bathed in light and full of plants that are unavoidable detail rustically designed homes. 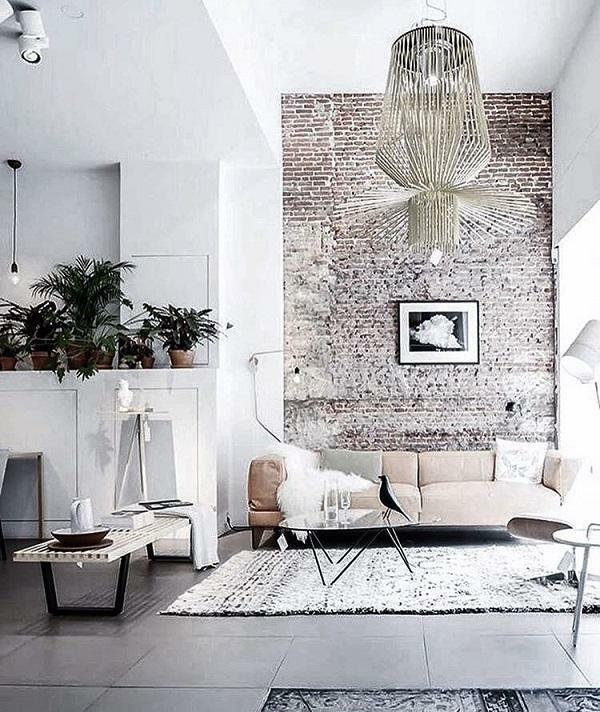 Cold, straight, modern lines of minimalist style softened by this wonderfully warm brick wall. The whole area looks because of bricks warmer and more comfortable. 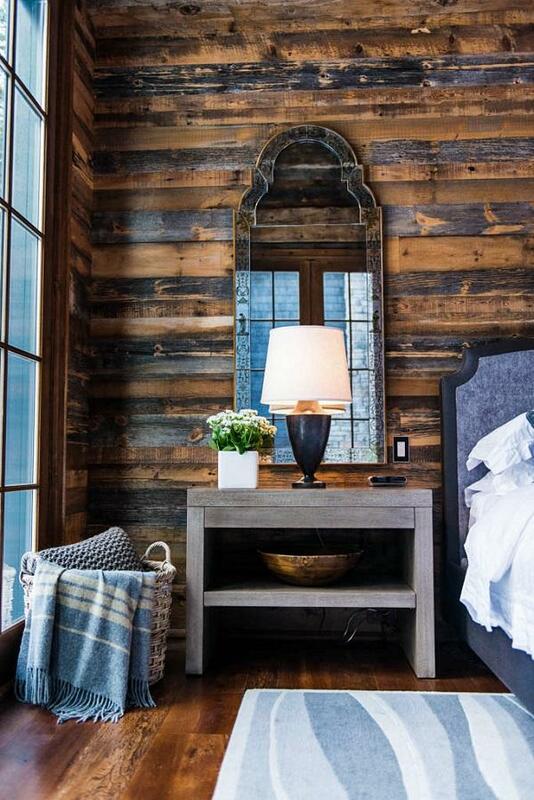 Lovers of rustic designs prefer a lot of light in homes. Plants in clay pots, which gives an extra dose of warmth next to the skin and fur is also used for decoration. This wall is not old and non-painted for long time. It is only painted with beautifully harmonized colors to give the impression of the old wall. Two cats are there to relax you after a hard day at work, with their gentle cajolement and their presence. 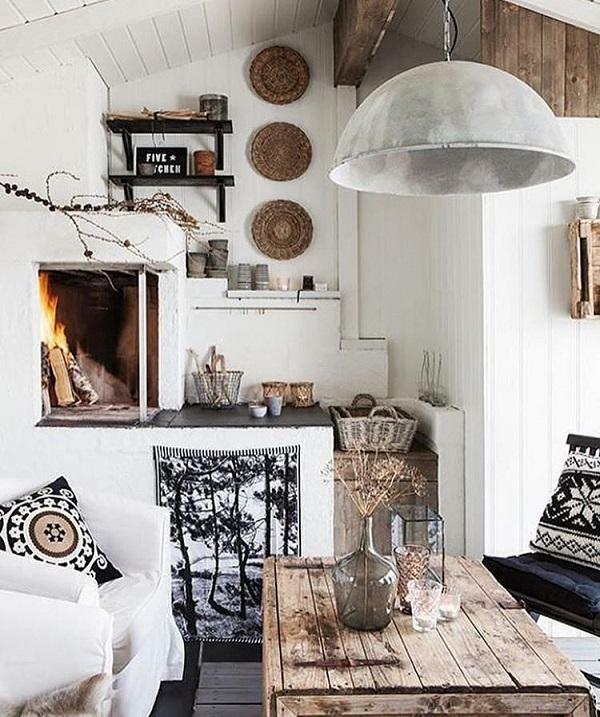 This room is in addition to the rustic style, decorated in Scandinavian style a bit. 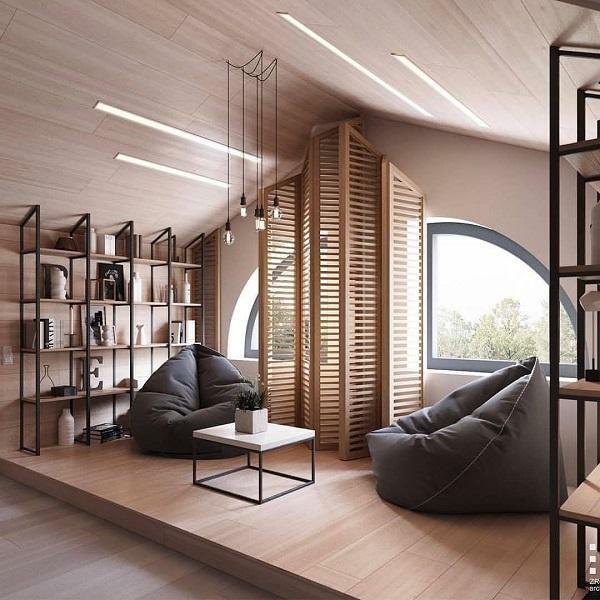 There is plenty of natural light, the walls are white, the floor is also in bright color, no carpets and curtains, and dominates wood as a natural material which Scandinavians give great attention. 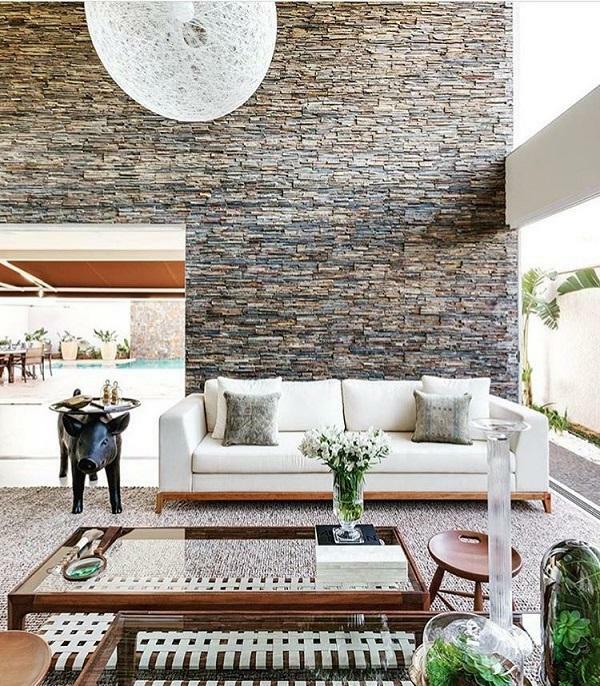 The brown color and earth tones generally contribute to the kinder and more comfortable layout of the house. 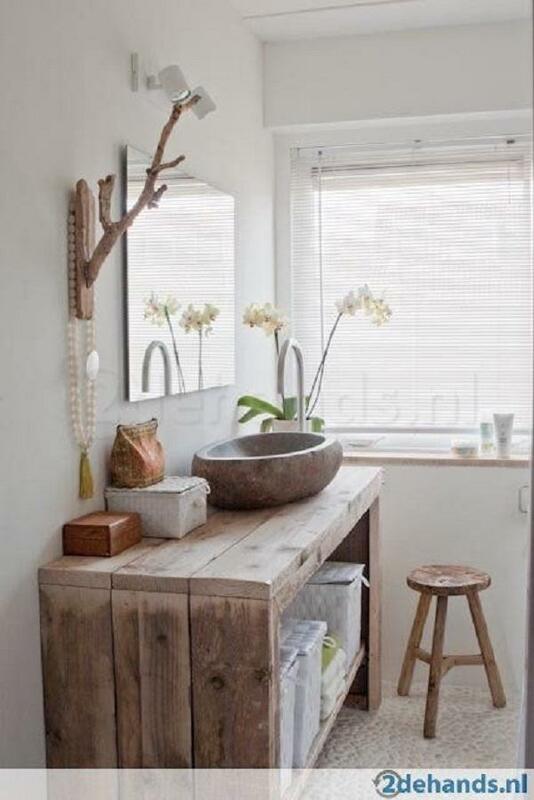 The stand of wood for sink is very interesting, and plant gives life to the entire space. Look at these pillows and carpet on the wall with a little outdated motifs. Black and white combination is evergreen in almost every aspect, so that the rustic interior designers often opt for this combination. If there was no fireplaces whole area would have seemed somewhat cold and uncomfortable but fireplace is there what radically change the impression. 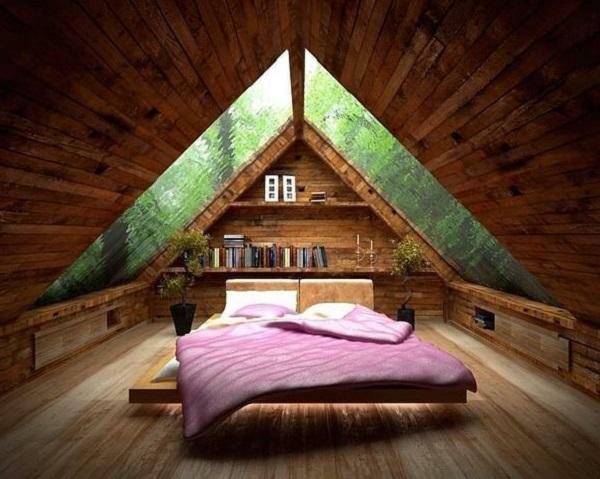 Here’s an idea how to arrange the attic and make your little corner for relaxing with a good book. 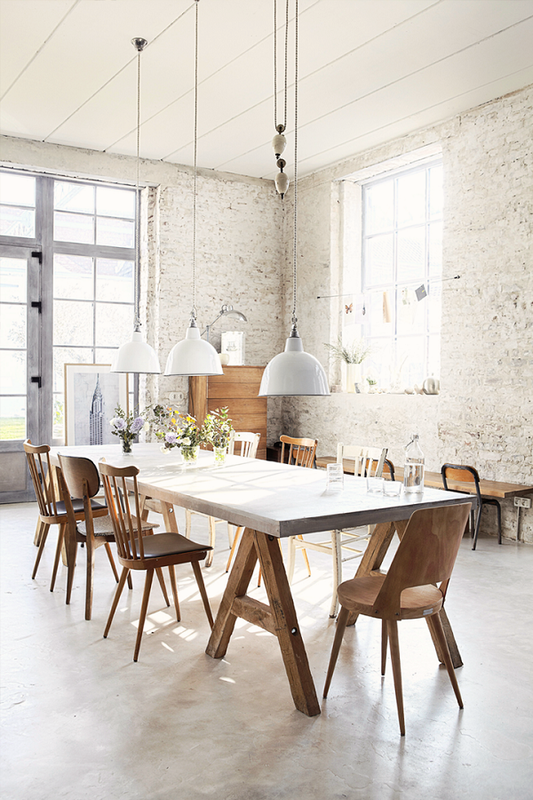 The most effective part of furniture is this old table that fits perfectly with other modern furniture. Does reminds you something more on childhood than this healthy fruit that brought mothers and grandmothers to us. Today in this fast world we often forget to eat these healthy foods. 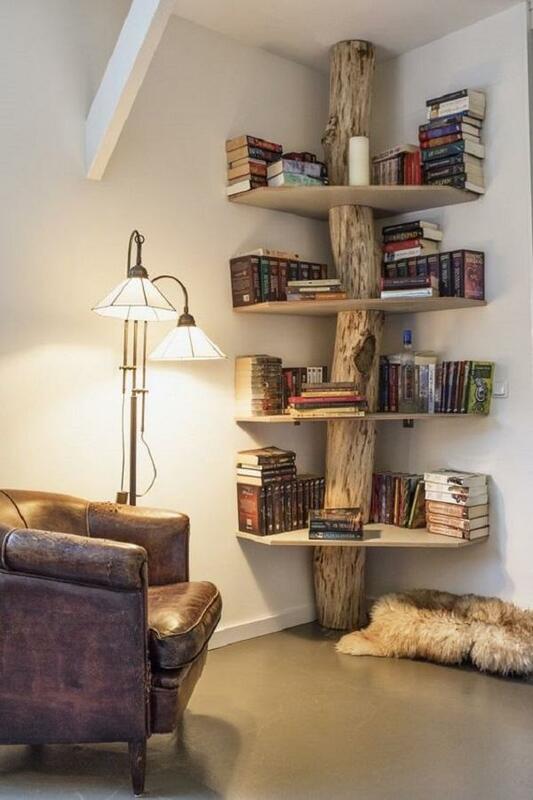 Rustic things have their own magic. They take us back in time and tell its own story. Today in modern homes but also in old houses can often encounter animal figures like these on the wall of the bedroom. 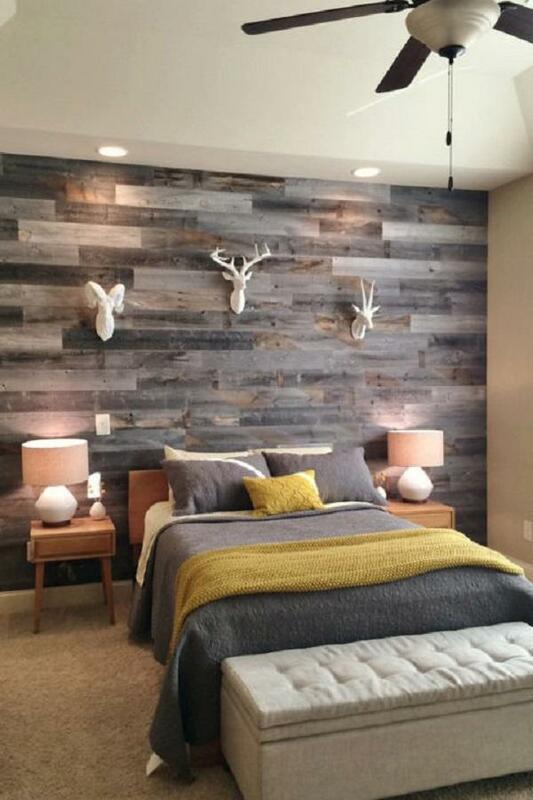 Wall covered with wood contributes to the overall impression. White walls are somehow classic … This is one high-quality table made of real wood that will surely adorn your room for a long time. The living room reminds of old basement in which may people contain the highest quality wine. 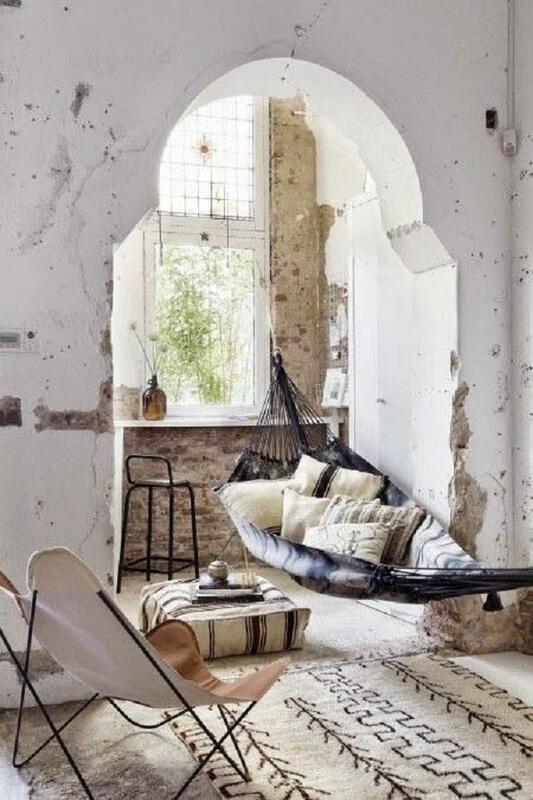 Here is in a function of the living room and looks really romantic and interesting. 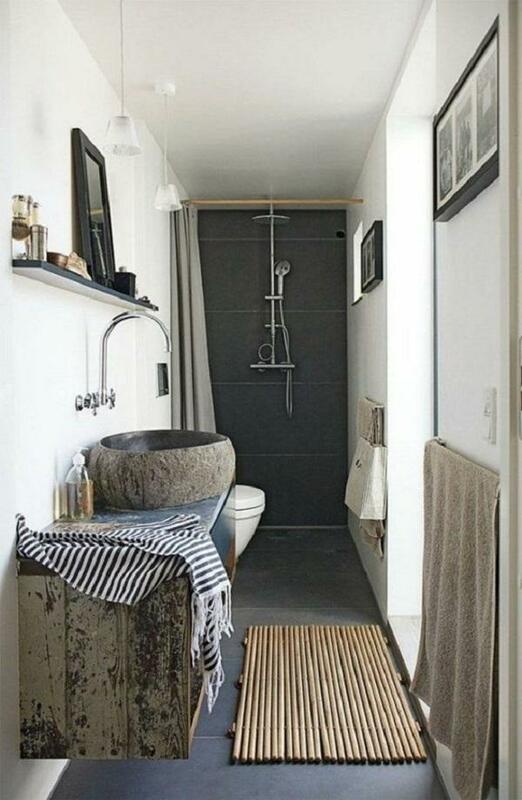 Although it has old look of the furniture this bathroom is modern, with straight edges, no curtains, chair and a pedestal of sink contribute to the rustic appearance. If you have old chairs or have small children and want to save your new chairs from stains easily help yourself this chair covers that look very festive and beautiful are right solution but they are practical for daily use also. 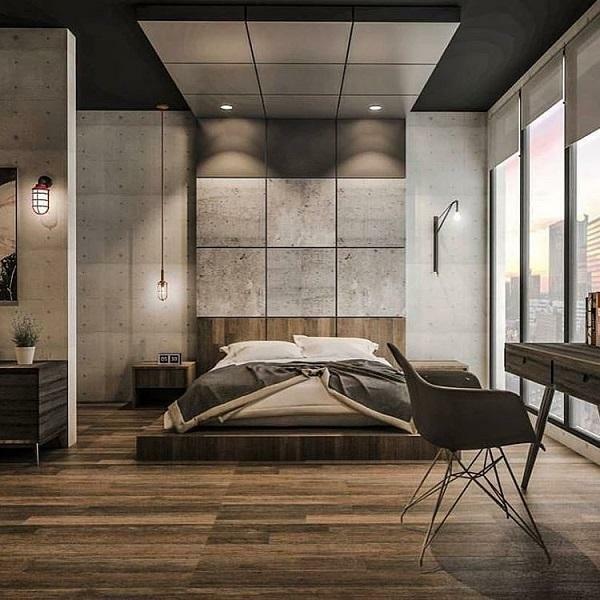 The bed is really in modern design, but what reminds me of the Middle East ais this low table that are used for food. 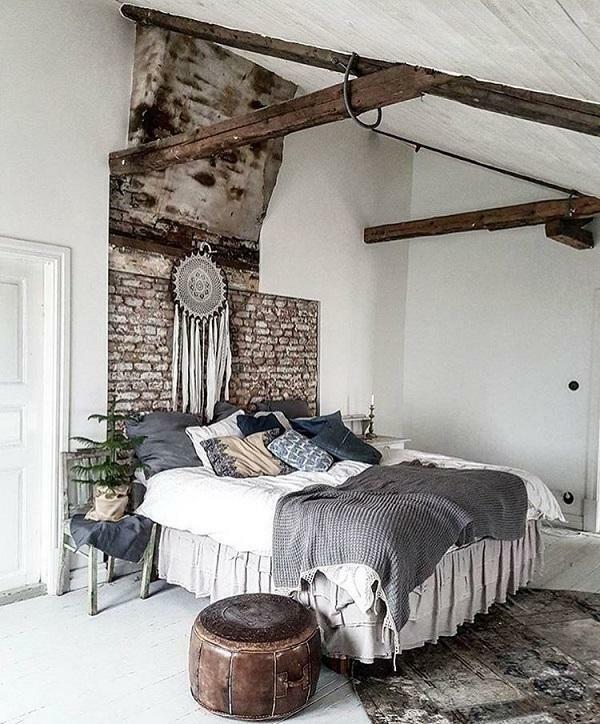 Fur rug mat on the bed contributes to the rustic look of the home. In the end most of these antique designed house fur is a command. 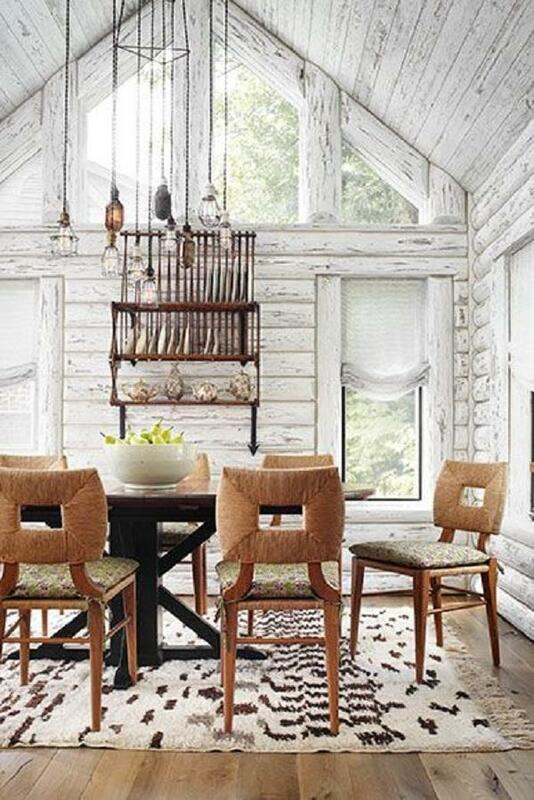 Rustic homes look tucked and this dining room certainly looks that way too. Wood is equally represented in houses, in cold and hot climates. 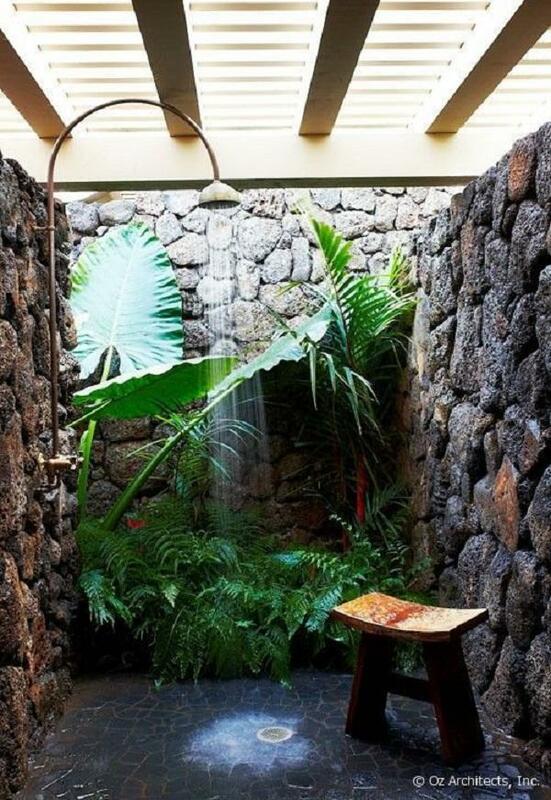 It maintains the humidity and gives the impression of tranquility. 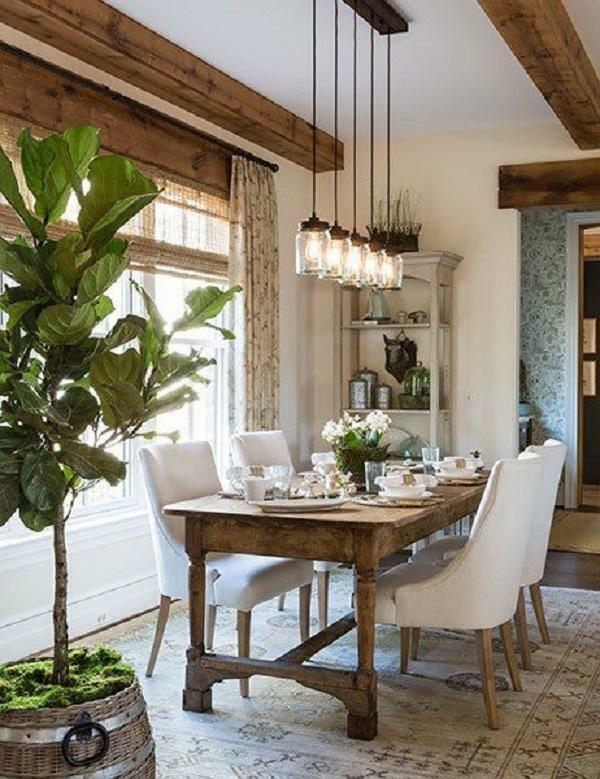 Take a look at this chandelier that looks very old but fit perfectly in this modern dining room. Windows are from floor to ceiling which provides enough light in the room that is coated in a darker wood, so it gets a lot of good natural light. Furniture made of full natural wood is characterized by exceptional quality and durability, so it is worth to invest in such a piece of furniture. Be sure that you will long enjoy it. 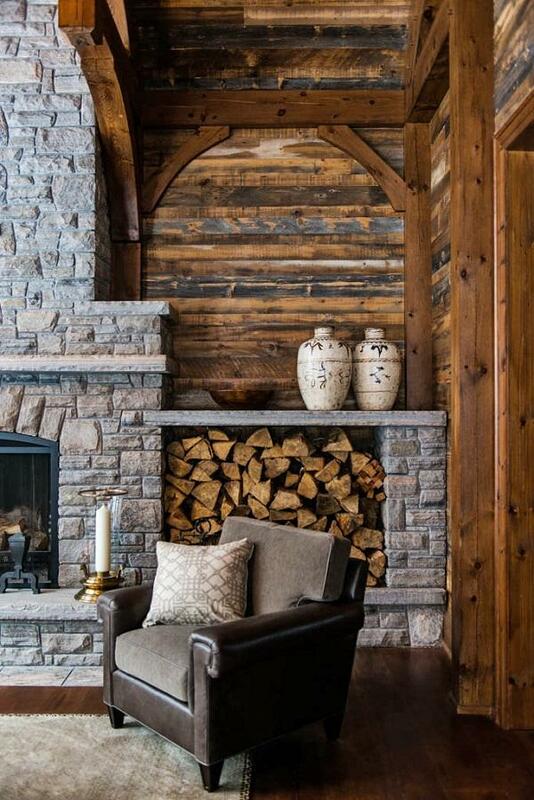 Rustic design can be applied in all areas. 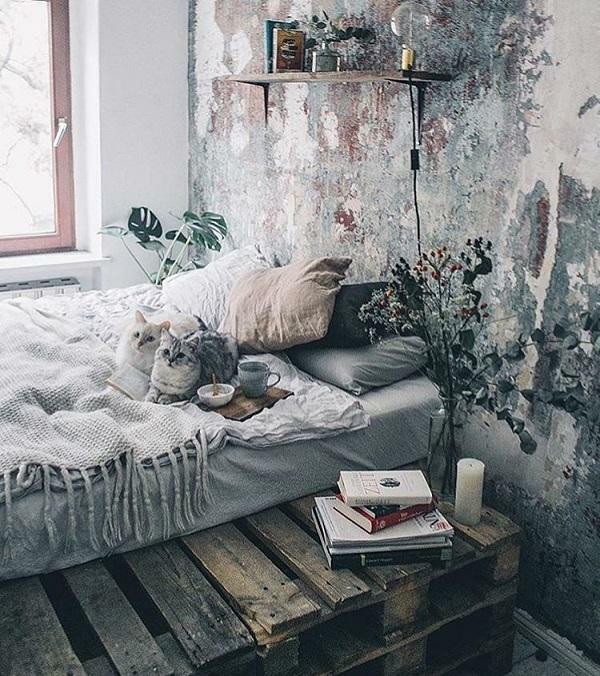 Does anything lopk more rustic than this seemingly old and unpainted wall? 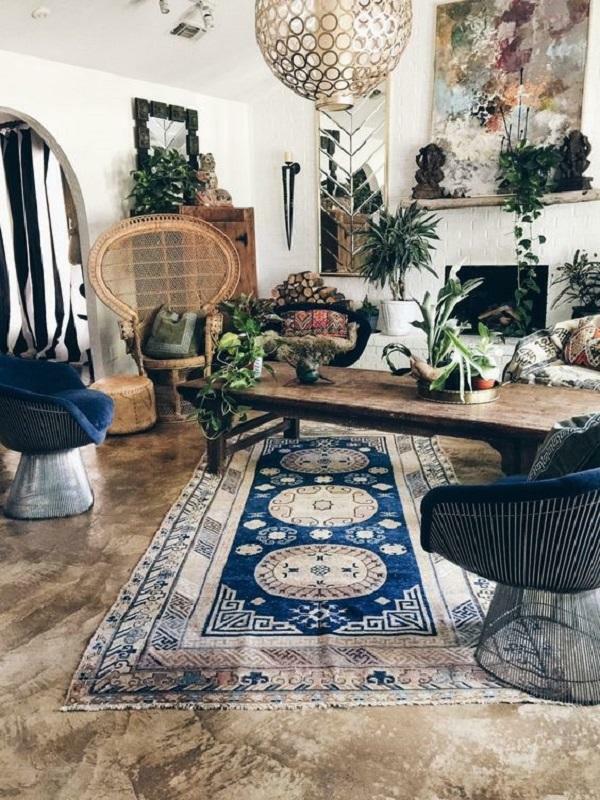 When you do your home in this way, take care about details such as chandeliers, lamps, design of furniture and pillows and please don’t forget large beautiful plant one or more – depending of what the room is in question? 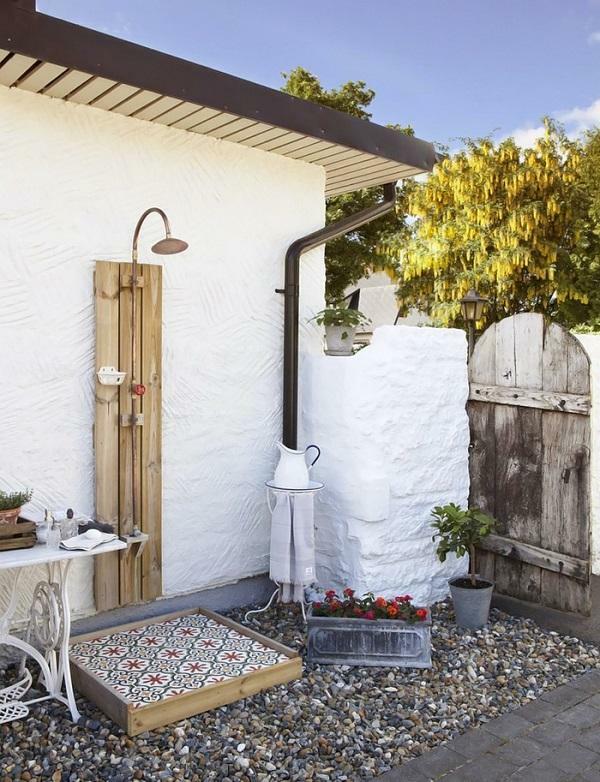 This room – bathroom, has enough light and moisture for flowers to flourish. That’s one idea for decoration of your bathroom or where to store the flowers in the cold winter months when you enter it in the house! Beautiful carpet and blankets in older design. Definitely this pattern in this room perfectly fit. Look at the table and bowl on it. Perfect and functional … Think about it. The ceiling is coated with boards that are painted white like the walls. 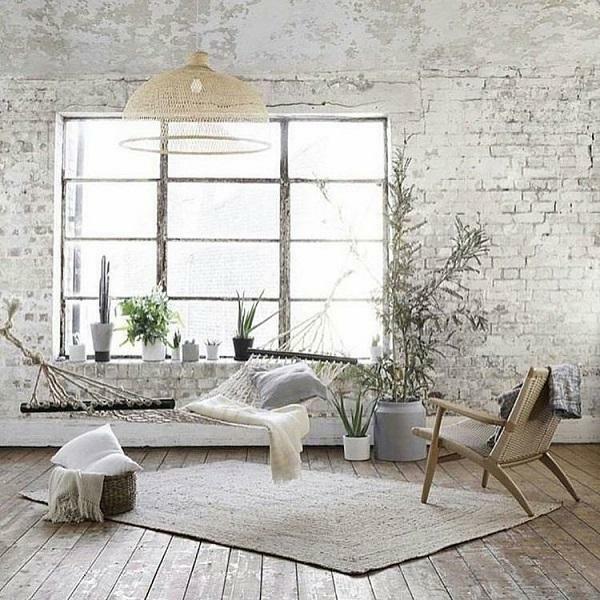 LIGHT colors definitely open space and make it larger and more cheerful, in contrast to the darker colors that can bring anxiety and depression. 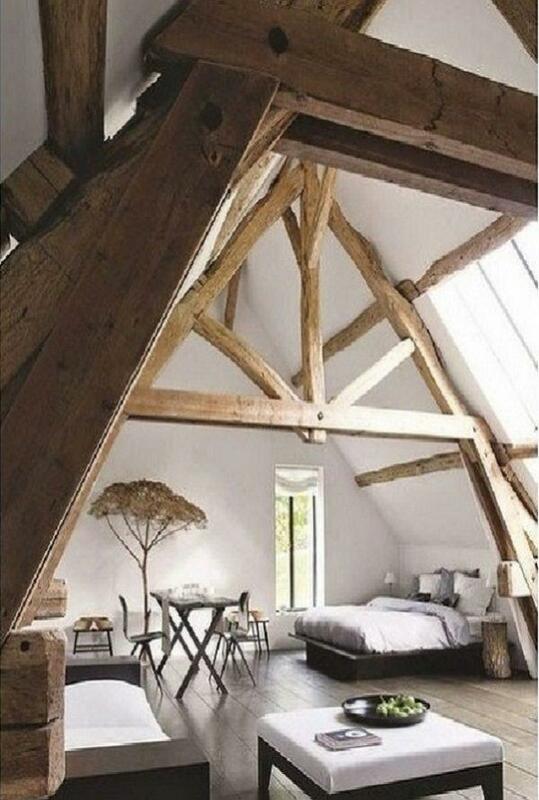 Old houses characterizes high ceilings. If your family members are not fans of this style furnishing you don’t need all home to decorate in this way. You rustically handle only one room or a corner just for your soul and your rest, it will be enough. If you are in doubt of what color of wood to choose, play it safe and choose light colors such as white, color of natural wood or beige. Pay attention on design of the tiles in the shower, and the gate, which actually looks like it becomes from ancient times. Even uneven wall of the house is reminiscent of the past days that can be saved in only this way, the decoration of modern homes in this style. 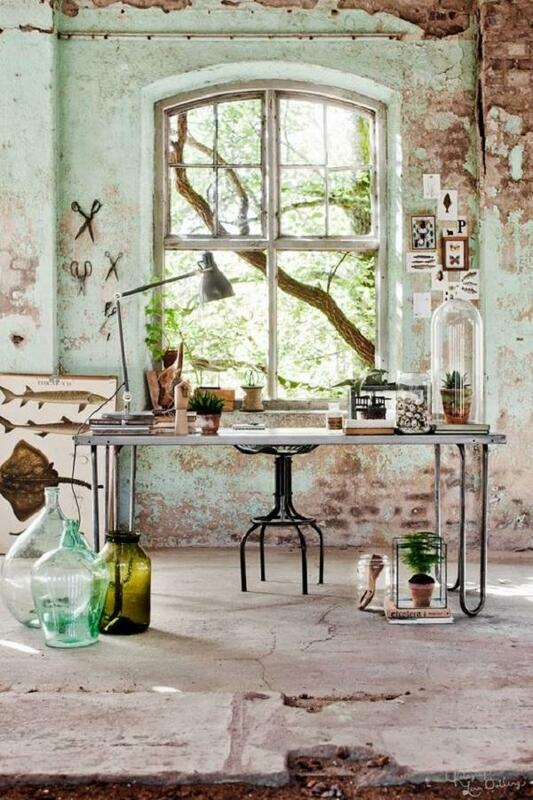 This room reminds me on the studio of an artist, painter or sculptor. Here’s another idea of ​​how to use the stump. This time it has been applied in the bathroom. When you want to use the rough wood in the room, my advice is to opt for pine, which has a lot of nodes, is imperfect and can greatly contribute to the decoration of home in this way. If you don’t want your house to look like a log cabin, take care of color of the wood you choose (select lighter shades), but also be careful not to overdo with the amount of wood in the home. 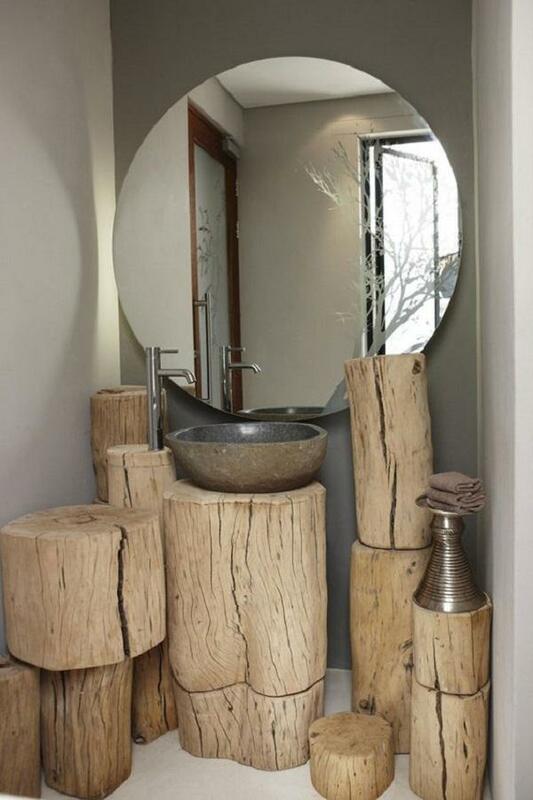 Here’s another idea to use untreated wood. The floor is covered with tiles that are easy to maintain. 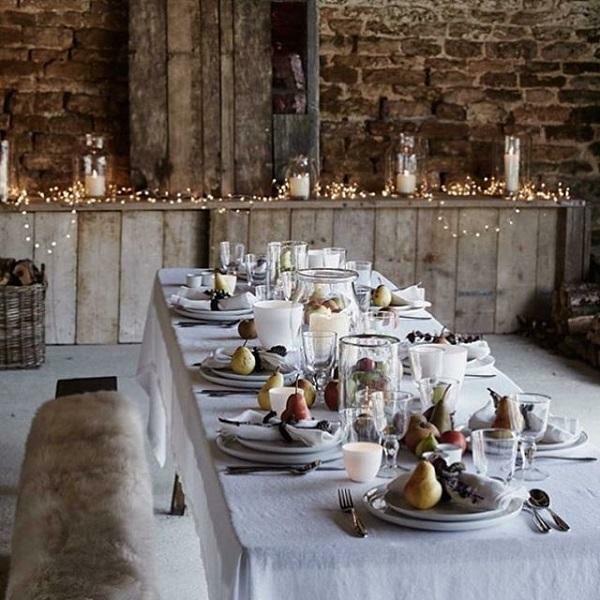 I would like, for example, to arrange dining room in my cottage in a forest. 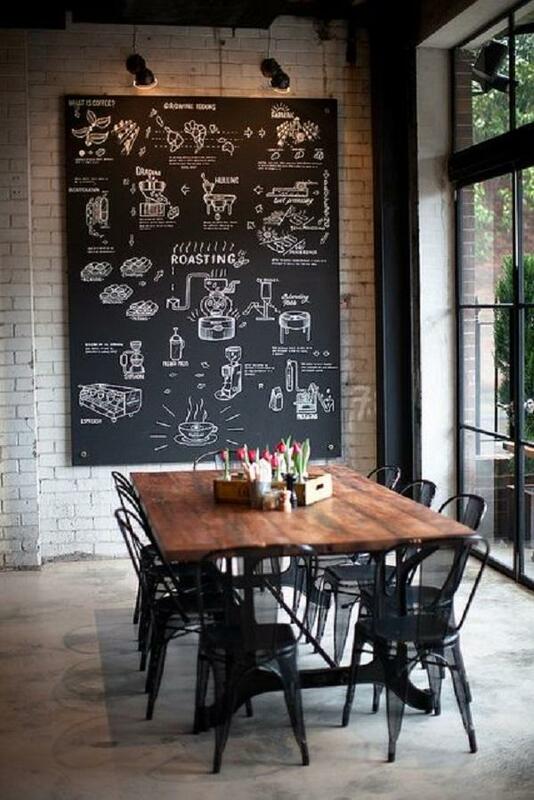 But of course this is my opinion, if you prefer, you can also dining room in your own home edit like this. A lot of plants do not forget in a room that has a large amount of wooden elements because the plant will refresh room and give it life. 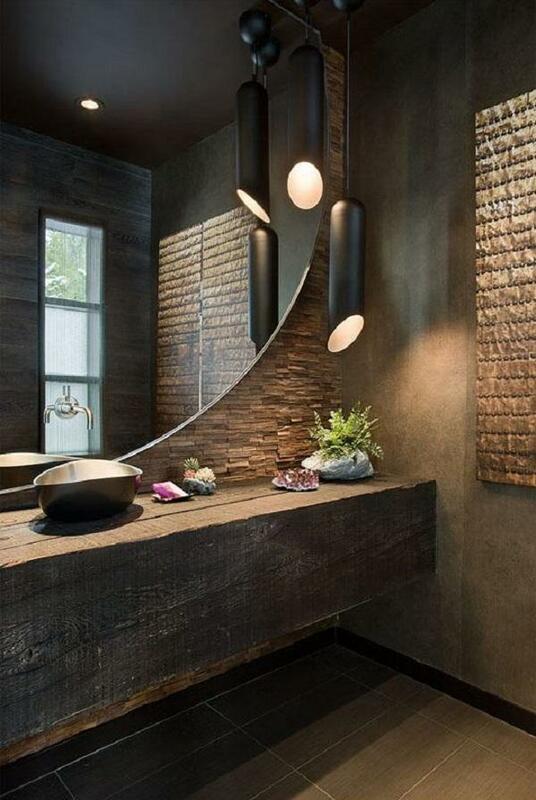 In rustic design emphasis is on natural colors. 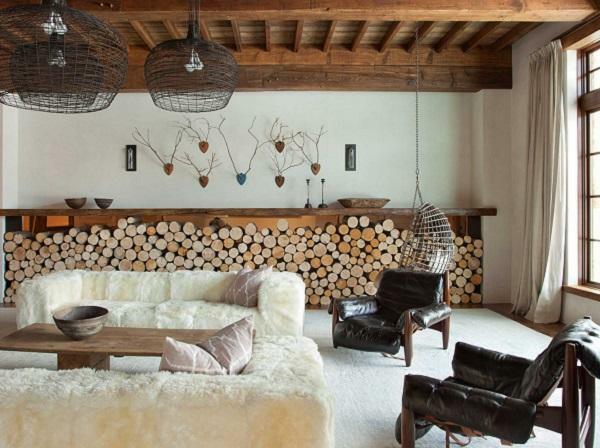 This room is filled with natural materials, wood, wool, leather, and there is also plenty of pottery and natural light. 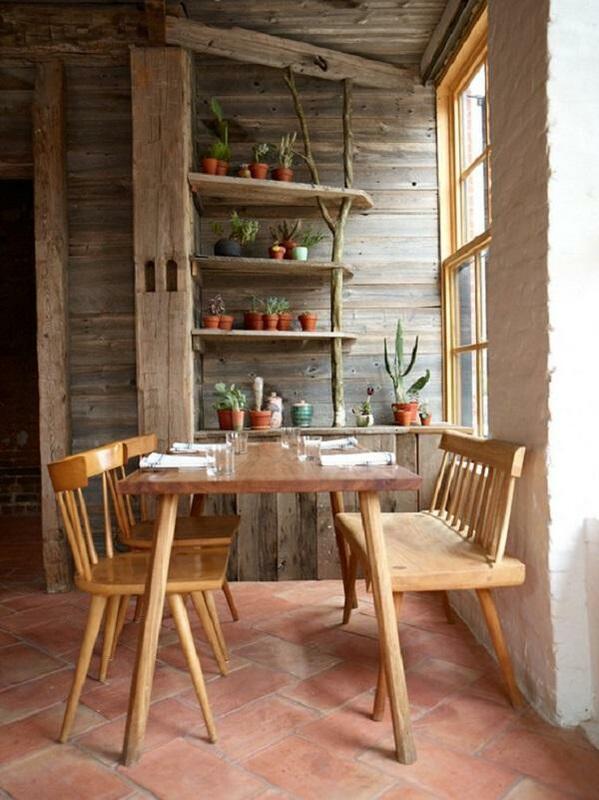 Sometimes it takes only one rustic detail to refine the entire space. In the antique fairs at affordable prices, you can find many rustic items that will decorate your home. 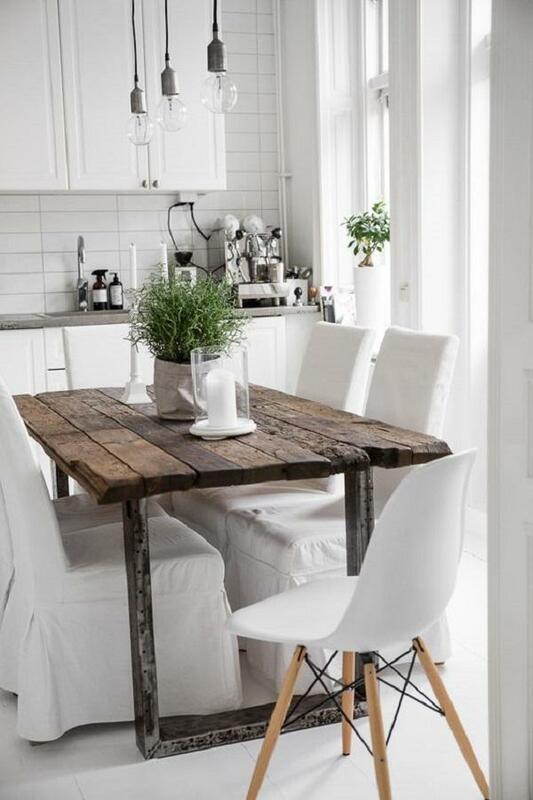 Great massive wooden table can sometimes be enough to give your room rustic touch. 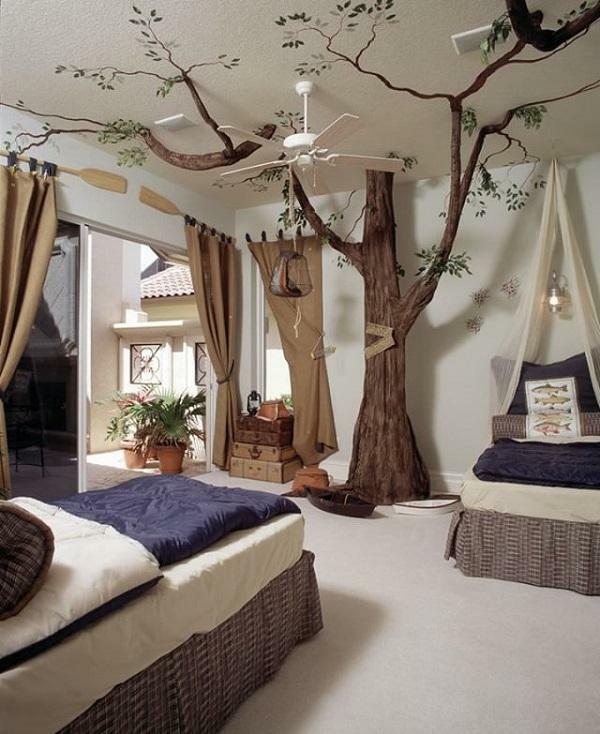 The room is filled with plants that make more room seem comfortable and pleasant. 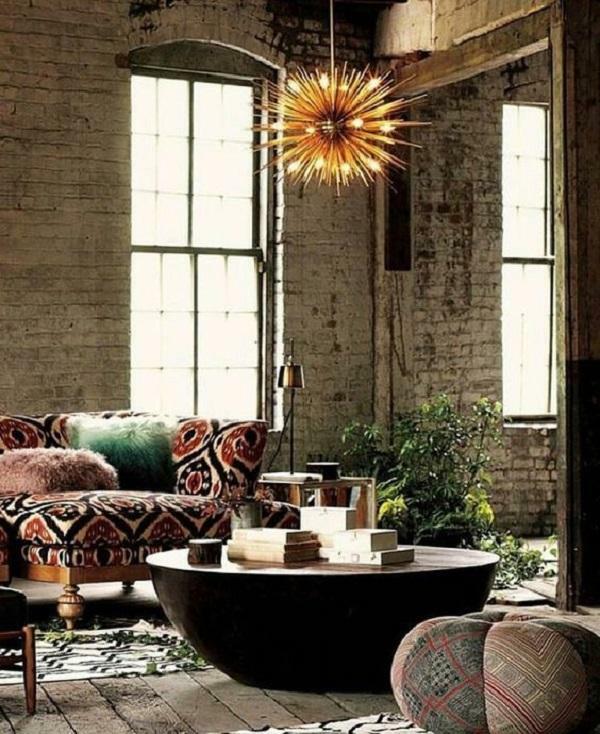 This is a modern arranged loft enriched with a few rustic details like this chandelier and some ceramic ornaments on the shelf. 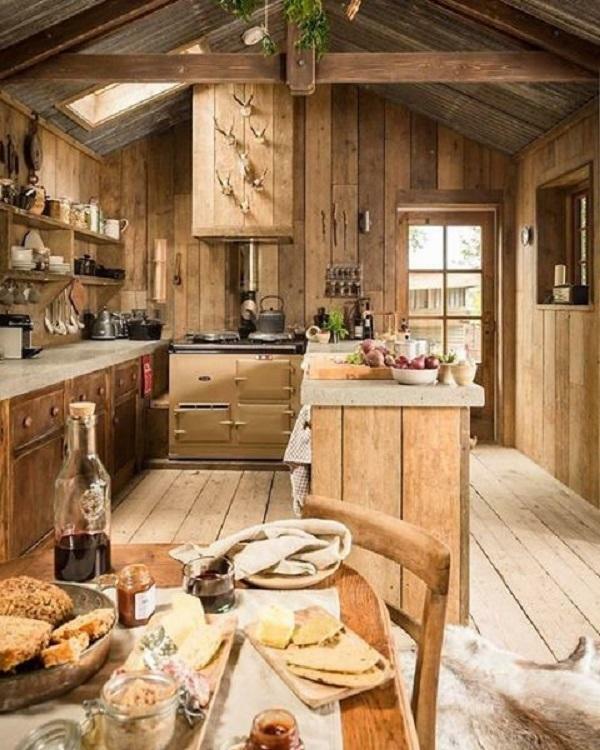 In rustic kitchen dominate parts of real wood which have style and are functional. Hanging shelves are simple but also most importantly functional. 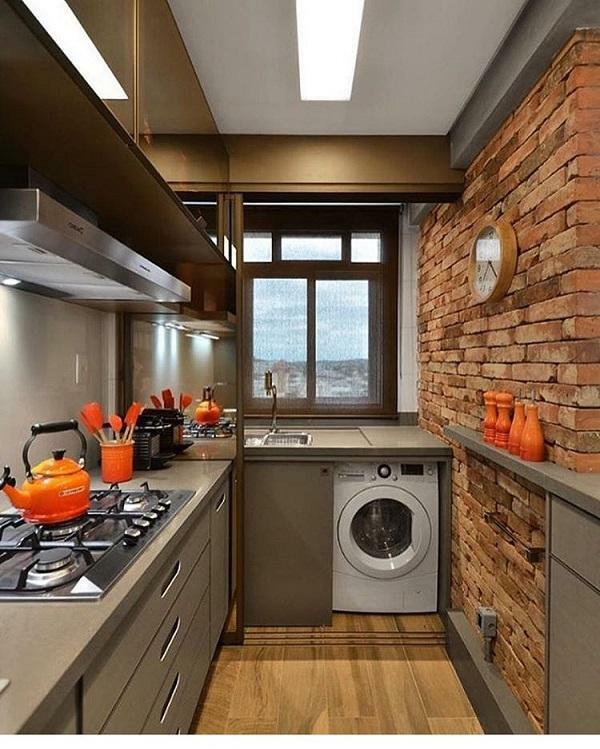 From floor to ceiling, this kitchen is made of wood. As such, it is associated with the family, fellow ship and relaxation. Modern home enriched with a lot of details from real wood beautifully processed and with straight lines. 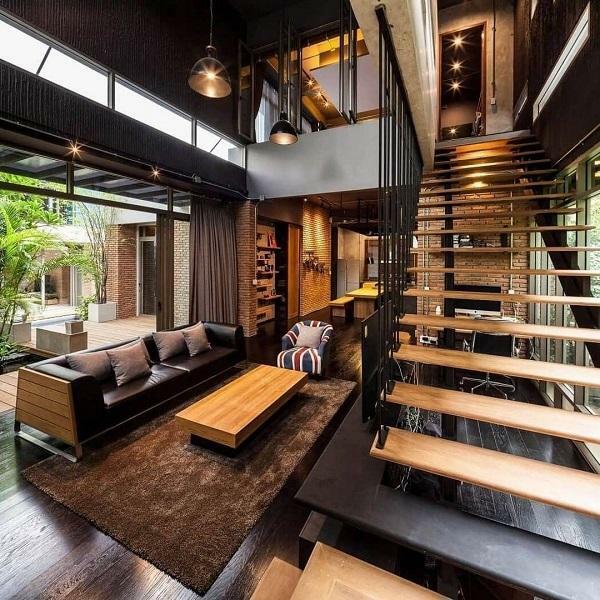 Although is fully modern this home looks very comfortable and nice. The mat in the bathroom made of woven wood, bamboo or rattan, is very beautiful decoration and also useful because it will protect you from the cold tiles. 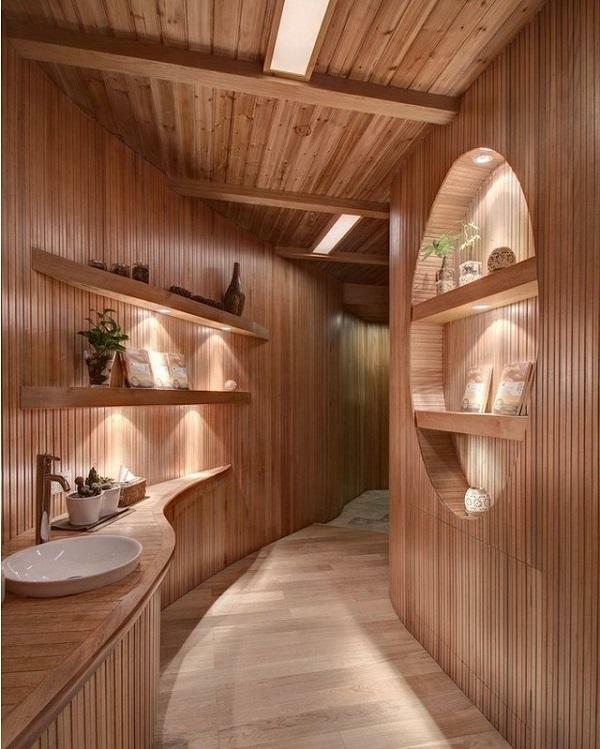 For the decoration of this bathroom was exploited nicely processed wood. This is a nice, warm bath which has a somewhat ladylike touch. And at the end of our gallery we represent you modern bedroom for long and romantic nights. 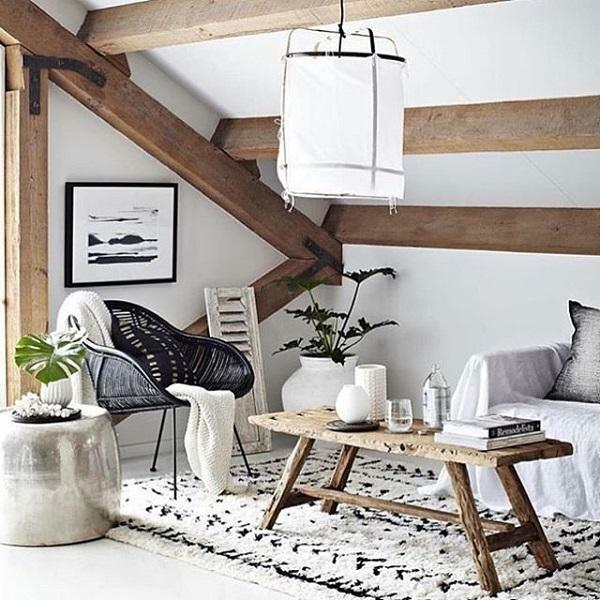 The floor is made of wood that will give you extra warmth beside love and rustic details such as chandelier and lamps perfectly fit with the rest of modern furniture. The use of wooden furniture for interior design is a great idea it really gives a rustic touch to the interior of the home. 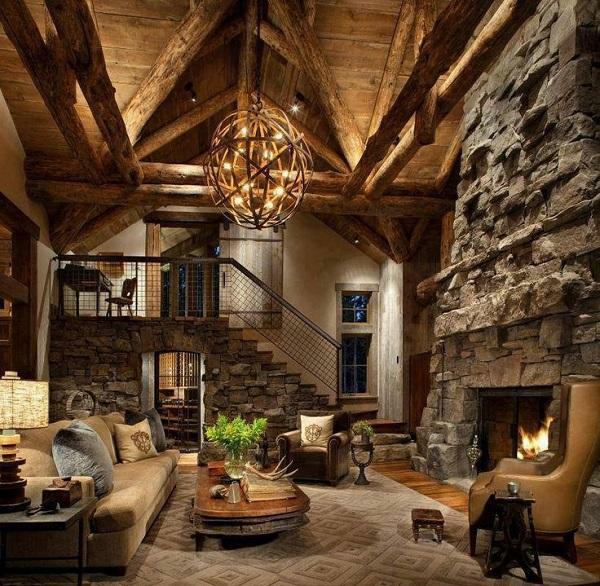 Thanks for sharing the rustic interior design ideas.